Five members of my family came to stay for two weeks just prior to Easter. This was a much anticipated visit, as it was the first time that Mum, Dad and my youngest sister had been to see us since we had emigrated. Another sister and her husband joined us for the first few days, filling our two-bedroom apartment to the maximum extent possible (which needless to say was delightful!). In the weeks leading up to their arrival, we talked frequently about the weather and what clothes they should bring. I brazenly promised them clear autumn skies, deliciously warm days and a comfortable absence of summer humidity, but what they got was hotter and more humid than the peak of New Zealand summer. With temperatures reaching or exceeding 30°C most days, the air conditioning was in regular use, our supply of ice needed to be constantly replenished, and all the bedding we had bought for our houseful of guests went unused in favour of cotton sheets only (and even then, barely). The discomfort of our guests made Colin and I realise just how much we have hardened to the Brisbane heat, but even we have felt like this summer was never going to end. It was late September last year that we first started sleeping with a sheet only – that’s seven months of sticky nights, sweltering days, and flagging energy. Call me ungrateful, but I have been longing for cooler weather – and finally, (hello duvet!) it’s here. 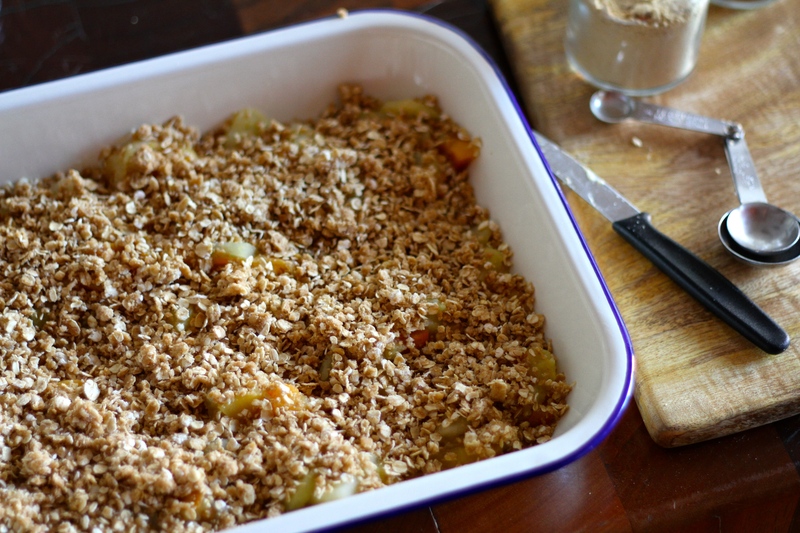 I made this apple crumble on Easter weekend when I was feeling under the weather and craved something soft and warm. It was still too hot, really, for such a classically wintery dish, but I could sense summer teetering into winter and thought that a crumble might help to magically coax it along. After all, I used to make some variation on apple crumble almost every winter weekend in New Zealand because what could be more cosy than hugging steaming bowls of spicy, appley goodness to our chests while the rain poured down outside? Apple crumble means winter to me in the most deep and meaningful way. It’s restorative powers rival soup, and while eating it I can’t help remembering so many winters past, coming home damp, cold and tired, closing up the house against the dark, thawing out in front of the fire and reading on the couch into the night. I love the warmth of the sun, don’t get me wrong, but it’s the crispness and harshness of winter that makes me truly feel alive. I had been planning this crumble for a while, inspired by the bright orange persimmons appearing in the stores alongside the new season’s apples. Normally for apples alone I would use a combination of cloves and cinnamon to spice the mix, but here I elected to use ginger, which pairs nicely with persimmon. 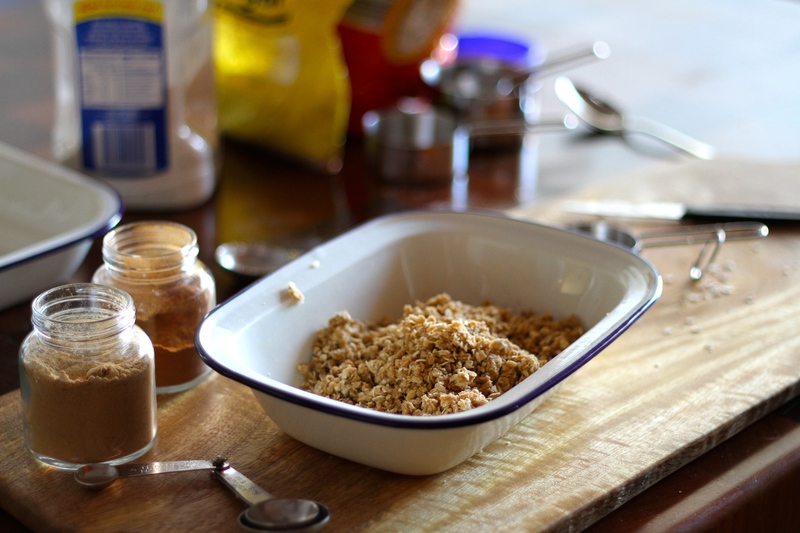 The crumble topping itself is informed by my mother’s approach, which involves heavy use of rolled oats and brown sugar and minimal flour and butter. This virtuousness means that the crumble can easily double as breakfast and I always make at least six portions to ensure I have plenty left over for this very purpose. I should also say that this recipe is more of a concept than a script, and the measurements given are really just a guide. It’s hard to go wrong, so as you wish, use more or less fruit, make more or less topping, add more butter and sugar to make it more indulgent, switch the persimmon for frozen blueberries or pear, experiment with different spices, different nuts – you get the idea. The real secret, of course, is that it tastes best on a grey, chilly day, although it’s pretty good too on a warm autumn one when you are only dreaming of, and longing for, rain. 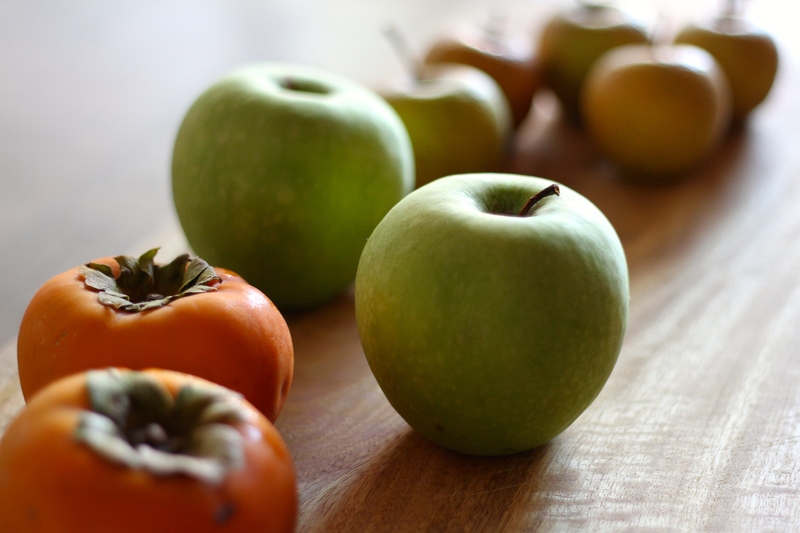 Peel and core the apples and peel the persimmons, then slice the fruit into 1-3mm slices. Don’t be too fussy about uniformity – it’s more interesting to have a mix of smaller pieces that will cook down and disintegrate, and larger pieces that will remain intact to provide a textural contrast. Place the fruit in a medium saucepan, add the chopped crystallised ginger and a dash of water. Cover, bring to a simmer over a medium-low heat and cook until the fruit has softened and is beginning to break up – about 10 minutes. Give the fruit a stir once or twice to ensure the fruit is cooking evenly. Preheat the oven to 180°C/350°F. While the fruit is cooking, prepare the topping. Place the butter and flour in a medium bowl. Rub the butter into the flour with your fingertips. The ratio of butter to flour means that it won’t amalgamate uniformly, so just ensure it is roughly combined with small pieces of butter remaining. 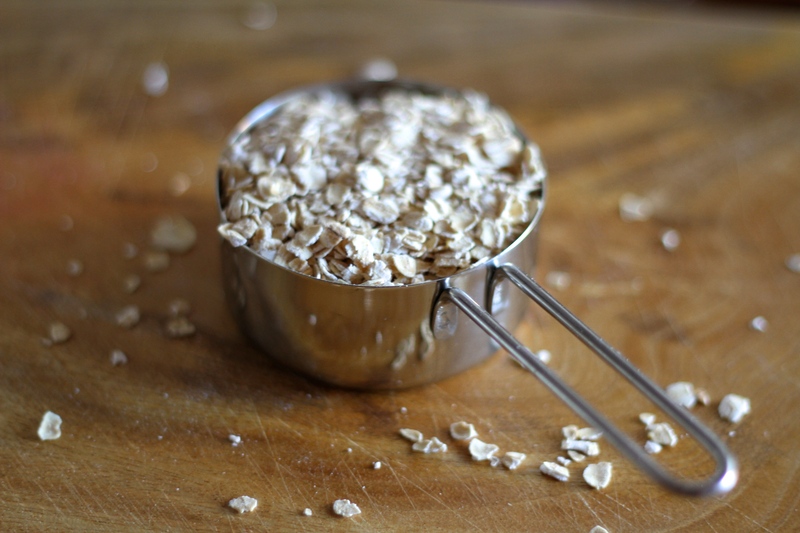 Add the oats, brown sugar, spices and almonds (if using), rubbing the mixture together until incorporated. Once the fruit has softened, transfer to a shallow baking dish and spread evenly over the bottom. Top with the oat mixture and place the dish in the oven. Bake for 30-40 minutes, or until the oats have browned. Eat warm with a drizzle of cream or custard, or cold with unsweetened yoghurt. This looks so yummy. Thank you fir sharing! Ohhh I love persimmons, so nice to see them being used!! We grew up with them, grown by my grandparents, they’re so underrated! Beautiful recipe for winter, can’t wait to try this! Hi Jess, I think they are underrated too – not many people know what to do with them. Hope you enjoy the recipe! I tried a persimmon raw once (as part of my ‘buy a fun new treat at the fruit store’ addiction) and I didn’t like it. Does it morph into something more delicious when cooked? Persimmons aren’t for everyone! It pays to know what variety you are buying. Fuyu persimmons are meant to be eaten firm and crisp, like an apple, while Hachiya are meant to be eaten very ripe and very soft. I like eating raw, crisp Fuyu, but can’t stand any kind of soft persimmon. 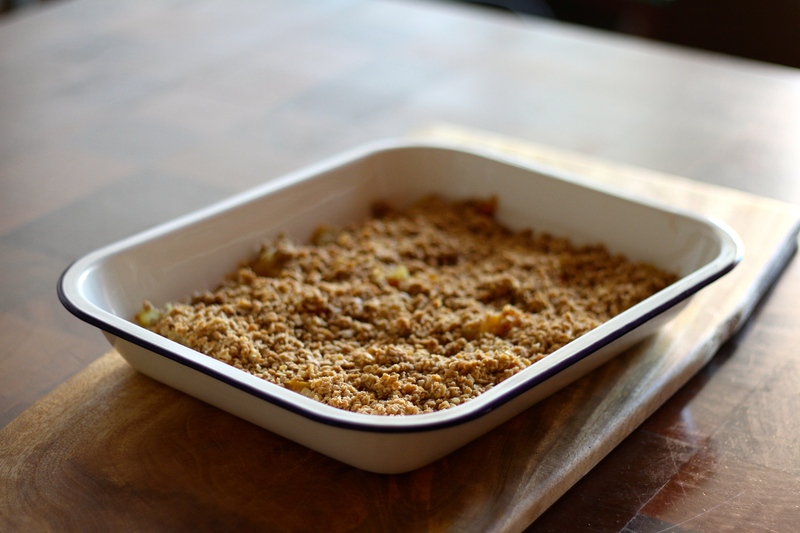 Stewing and baking fuyu persimmon in this crumble emphasises the rich flavour of the persimmon. It would be too rich on it’s own for me, which is why I like to mellow them out with apples. Crumble is one of my favourites! This sounds divine. It’s pretty good – I made again on Monday night and just had the last leftovers for breakfast! 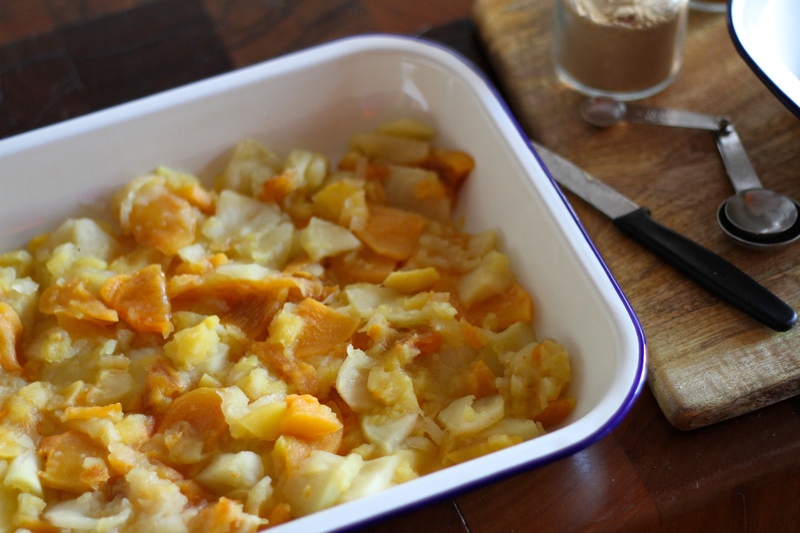 Great idea using persimmon in a crumble. It’s such an interesting fruit but i often wonder what to do with it. I think it’s the tough skin that throws me. Looks great! I will have to save the recipe for when the Persimmon season returns.. Which will be later this year for you, I assume? Wow sounds divine! I live winter for that same reason plus the fashion is also heaps of fun! Yes although in Brisvegas maybe not so many layers … But yes boots and scarves and coats and cardigans definitely in loads of beautiful styles and colours!